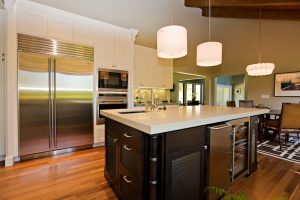 Hardwood plywood is such a uniquely versatile and rewarding material to work with, allowing builders to design and construct beautiful kitchen cabinets, ranging from traditional to ultra-modern. Plywood is an ideal material for custom kitchen cabinetry when quality, durability, and aesthetic appeal are goals that must all be met. 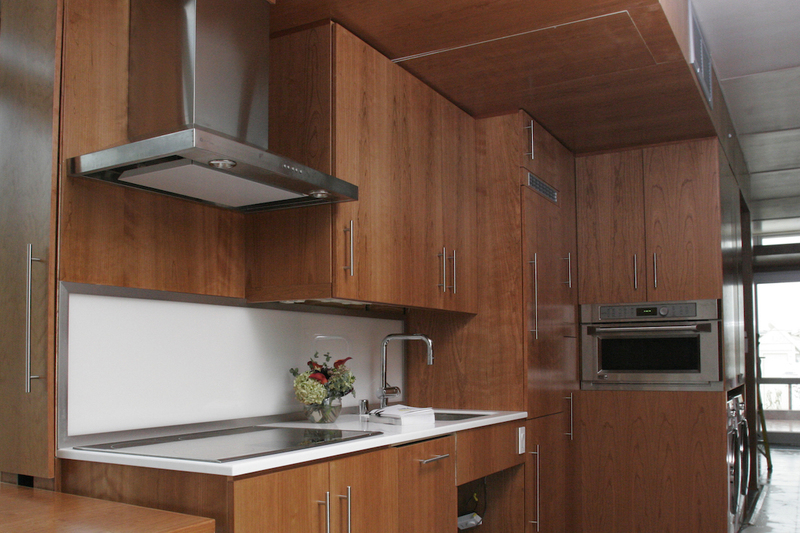 The use of domestically-produced hardwood plywood ensures that the finished product is as attractive as it is sturdy, resulting in cabinets that will bring years of satisfaction for the homeowner. Cabinets may be one of the most important functional features in a kitchen, but they also serve as a focal point to cement the entire interior style of this room. Get creative with your designs and consider using some of these featured ideas in your future project. 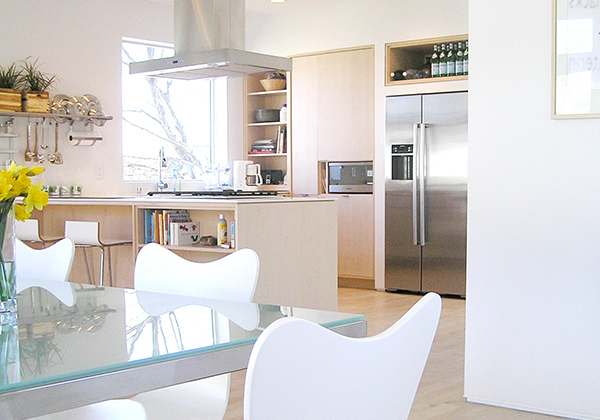 When you have sophistication and chicness in mind, you can’t go wrong with white cabinets. White cabinets instantly give the kitchen a clean, open atmosphere that naturally works well with any existing interior design theme. What makes these white cabinets pop even more is the addition of molding. Adding decorative molding or crown molding around cabinets isn’t difficult, yet it instantly gives the kitchen a more upscale and tailored feel. 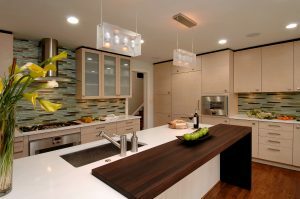 In this particular kitchen, the dark brown island pairs well as the white cabinets prevent it from feeling too crowded. The built-in cabinet look is a popular one, but an alternative take on the idea is recessed shelving built into the wall. This really helps make an otherwise small, cozy kitchen feel bigger while also giving this space a minimalistic vibe. The use of very light, natural plywood on the kitchen cabinets and island, combined with the light walls, further help give this kitchen an airiness. 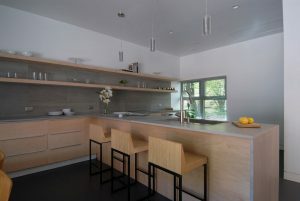 The open shelves allow for display of choice items while the additional shelves on the island offer the same function. 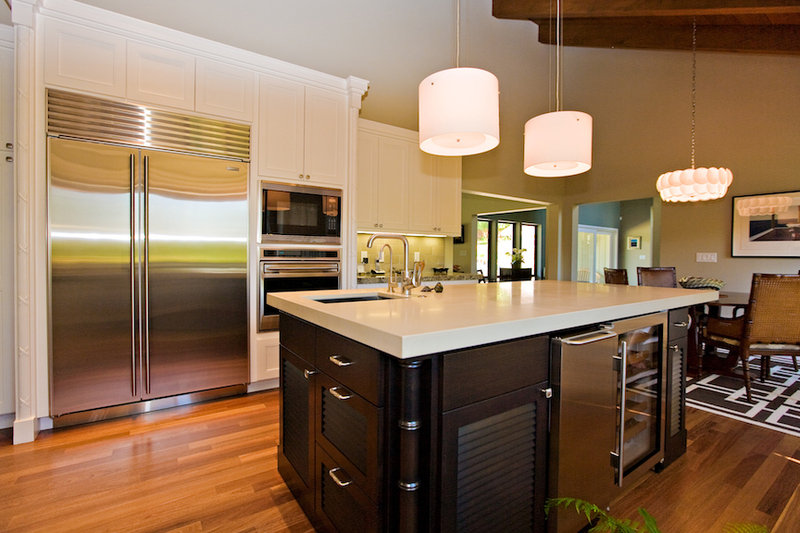 You can hardly go wrong with classic hardwood-faced cabinets that let the beauty of the wood speak for itself. The finish of these plywood kitchen cabinets has an ideal balance between light and dark, with a slight red-toned tinge to add richness. This cabinet look is perfected by the addition of stainless steel hardware and appliances, preventing the kitchen from appearing rustic. The sleek stainless steel cabinet pulls were an excellent choice over knobs which may have seemed too dated. Experimenting with cabinet doors might be that subtle touch that makes all the difference. The majority of the cabinetry in this kitchen is attractively minimal with the addition of classic cabinet door knobs and drawer pulls. However, there are a few small features that really make this kitchen work. The use of frosted panes on a section of overhead cabinets adds variety and style. The cabinets in this kitchen also are slightly suspended, which at first makes it seems like there is actually dark trim framing the upper edges. Finally, the addition of a contrasting dark, rich, chocolate-colored bar built onto the kitchen island is the perfect touch and shows how much effort was put into the overall design of this space. A twist on traditional cabinetry that has been trending recently is the use of open shelves in place of typical overhead cabinets. This simplifies the process of designing custom cabinetry, and certainly makes a big visual impact. These open shelves look durable and beautiful, matching well with the under-counter cabinets, island and even the bar stools. Rather than leaving the wall behind the shelves empty, a full-height backsplash was added instead. This really pulls together the whole look of this wall of cabinetry while still showcasing the open, floating shelves. These five featured kitchen cabinet layouts are just a glimpse into how innovative and artistic you can get with plywood cabinetry. 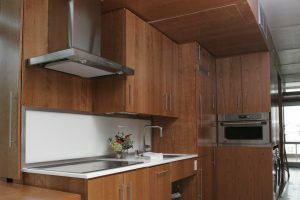 Focus on selecting high-quality hardwood plywood choices that match the interior design goal of the kitchen and consider how going with alternative cabinet construction (i.e. open shelves) can give this room a whole new feel. Remember when designing custom kitchen cabinets that you have a balance between aesthetics and utility to ensure the finished product isn’t only elegant, but also serves its function as storage space. Looking for additional inspiration on beautiful plywood designs? 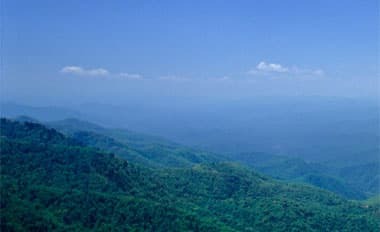 Check out our project gallery for a selection of projects made with formaldehyde-free Columbia Forest Products Purebond® hardwood plywood. Or read up on how to choose the best type of plywood for your next project.